Thai cuisine is approaching Chinese in its ubiquity these days, but it still offers some fun surprises — like the straight-out-of-Bangkok café hidden away on Littleton’s Main Street. Chef-owner Emshika Alberini grew up in Thailand, and her menu uses local ingredients to create classic Thai flavors. Don’t miss the non-entrée items. How about an imported Thai beer and dessert sticky rice with that green curry? Our beautiful menu covers come from Boxerbrand. Their wonderful blog showcases interesting stories about successful restaurateurs from around the world. This week, they featured Emshika! Emshika has been selected as the Face of Next Generation Leadership by New Hampshire Magazine! Check out the full online feature here. Emshika has been featured in the holiday issue of Edible New Hampshire Magazine! 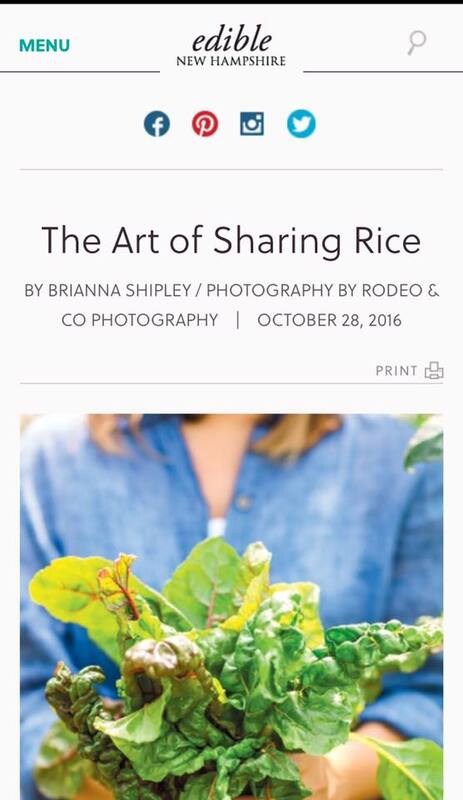 Stop by your local food co-op to snag your complimentary copy, or read "The Art of Sharing Rice," how Emshika sources local ingredients, on Edible New Hampshire's website. We are excited to announce that Emshika and Chang Thai Cafe will be featured in the November 2016 issue of Edible New Hampshire Magazine! The focus of the feature will be farm to table. Keep reading for a sneak peek! Emshika teamed up with Rodeo & Co Photography to capture her selecting the freshest ingredients for her dishes at Meadowstone Farm in Bethlehem and Ski Hearth Farm in Sugar Hill. Photos from the farm- and their fresh vegetables!- will make their print debut in Edible NH as Chang Thai Cafe's partners. Emshika is constantly looking for ways to incorporate fresh ingredients, developing the Kale Fried Rice recipe with Meadowstone's early summer kale harvest in mind. We're counting down to November!